Into a year teeming with global volatility, David Cameron introduced another giant unknown, rolling the dice on Britain’s most important economic relationship: its 43-year-old membership of the EU. In European capitals this was seen as an existential threat to the entire European project, while Eurosceptics across the UK saw it as the perfect moment to pull up the drawbridge. The political establishment fired back with a barrage of government data, third-country endorsements and world bodies’ opinions, unsure whether these long-trusted political weapons weren’t firing blanks. 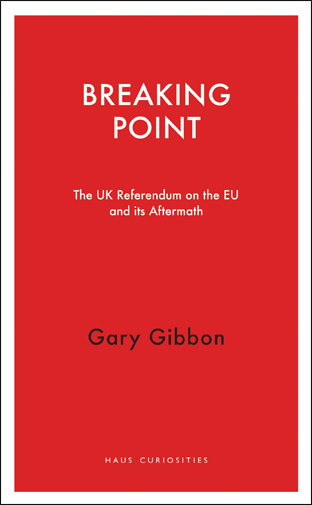 Breaking Point explains where post-referendum Britain is heading, how we got here, and what lessons might be learned. It combines analysis of official and off-the- record meetings with senior politicians as well as with ordinary voters. Gary Gibbon is Political Editor of Channel 4 News. He has reported on UK politics for the programme since 1997, including five general elections and major EU and G7/G20 summits. He won the 2006 RTS Home News Award with Jon Snow for revealing the Attorney-Generalʼs legal opinion on the Second Iraq War, the 2008 Political Studies Association Broadcast Journalist of the Year award, and the 2010 Royal Television Societyʼs Specialist Broadcaster of the Year award.